More than 30,000 people in northwest Syria have been displaced by Russian and Assad regime attacks, even before an anticipated ground offensive to reoccupy Idlib and northern Hama Provinces. Defying its own “de-escalation zone”, proclaimed alongside Iran and Turkey last year, Russia joined the regime in an escalation of bombing and shelling last week. Moscow is using the pretext that the “festering abscess” of “terrorists” must be removed, while Bashar al-Assad has vowed to regain “every inch” of Syria. 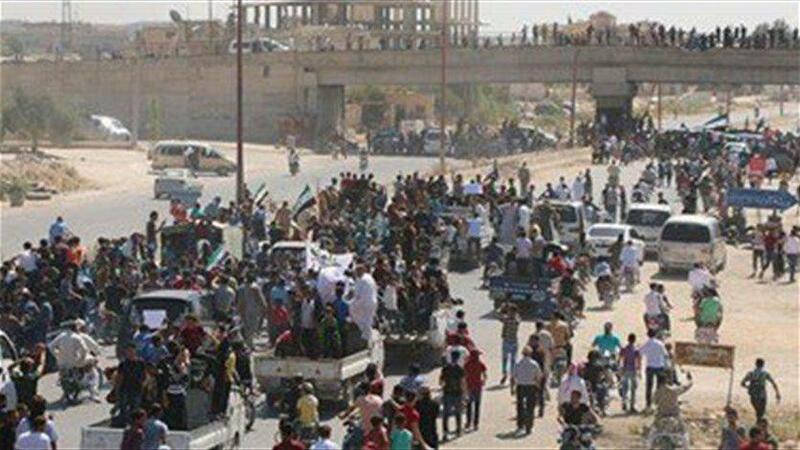 The UN Office for the Coordination of Humanitarian Affairs said an all-out military assault on the last major opposition area in Syria could displace 800,000 people, of the estimated 2.9 million in the province. The head of the OCHA, Mark Lowcock, warned about a toll adding to the more than 500,000 killed and more than 11 million displaced in Syria’s 80-month conflict. Abu al-Baraa al-Hamawi, a rebel leader in northern Hama Province, said about 95% of residents have left villages in northern and western Hama Province and in southern Idlib Province that have suffered intensive air strikes in recent weeks. Panos Moumtzis, the UN’s Regional Humanitarian Coordinator, confirmed on Monday that four hospitals have been attacked in less than a week — two of them having being struck on several previous occasions. So far the Russian-regime offensive has been blocked by the objections of Turkey, which has forces alongside rebels in the northwest. Ankara intervened in August 2016, first to push out the Islamic State and then to take most of the Kurdish canton of Afrin. Twice last month Turkish Foreign Minister Mevlüt Çavuşoğlu rejected pressure by Russian counterpart Sergey Lavrov, and Turkey maintained its line at a summit of Turkish, Russian, and Iranian leaders last week. Ankara maintains that “terrorists” can be separated from rebels and civilians while pursuing a political resolution. Russia has effectively erased the line between the jihadist bloc Hay’at Tahrir al-Sham, which is not covered by the de-escalation agreement, and rebels who do not surrender to the regime. Turkish Defence Minister Hulusi Akar repeated on Monday that air and ground attacks on Idlib must stop and a ceasefire must be established. There is a lack of water storage capacity in many of the areas in which we operate, with just two or three days worth of water available to civilians. The crossing points along the front lines between the government and opposition-controlled areas have been closed, and as a result, food prices have dramatically increased. The Russian-regime attacks have targeted medical facilities, knocking out several hospitals and civil defense stations in the past week. The pattern of aerial assault, disrupting services and trying to break the civilian population, is following that before the offensives on east Aleppo city in 2016 and on East Ghouta near Damascus and much of southern Syria this spring and summer. Turkish President Recep Tayyip Erdoğan has restated his opposition to an offensive, using the high-profile platform of a Wall Street Journal editorial. A regime assault would also create serious humanitarian and security risks for Turkey, the rest of Europe and beyond…. All members of the international community must understand their responsibilities as the assault on Idlib looms. The consequences of inaction are immense. The President reiterated the line of Turkey, which hosts most than 3 million Syrian refugees, that further displacements cannot be tolerated. He went farther in raising the future of Bashar al-Assad, citing the regime’s use of arbitrary arrests, systematic torture, summary executions, barrel bombs, and chemical and conventional weapons since the Syrian uprising began in March 2011. Claims are circulating of movement of Turkish personnel and armor into Idlib Province. It is unclear whether this is true or whether the convoys are still within Turkey, close to the frontier — Turkish media headlines, “Turkey Dispatches Tanks, Howitzers to Syrian Border“. Doubtfull on Idlib op. The russians and the iranians are left alone. Two countries with looming problems at home. Erdogan might pull this off. Turkish interests in this case go along with europeans and the US.